As discussed in a recent Blog, the discussion becomes less about the technology and more about the required business outcomes. 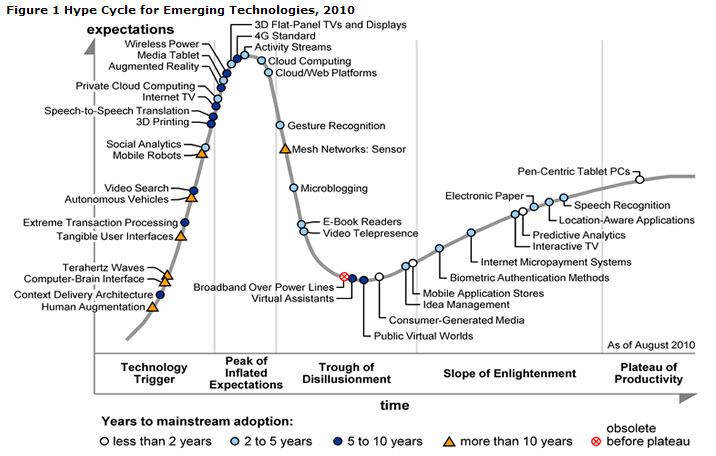 In the hype cycle diagram below, Gartner shows predictive analytics approaching main stream adoption in the next two years. Other forms of advanced analytics (i.e. Text Analytics) cannot be far behind. Picking up on Gartner’s thought of new applications, I see two broad categories of applications: risk management and voice of the customer. Risk management includes applications like fraud detection, brand and reputation management, quality and safety, and others. Voice of the customer includes customer acquisition and retention, marketing effectiveness, innovation, monitoring new product launches, and customer service. Advanced analytics along with social and workflow technologies will combine to create applications that address business needs in each of these areas. “The business use of social technologies is just emerging. We expect adoption to accelerate and to expand across business functions and industries. Even where overt social-media initiatives are not planned, examination of social technologies will become an imperative where key business participants (such as employees, customers, constituents and partners) engage in social interactions outside of structured or sanctioned enterprise technology solutions”. I couldn’t agree more. These social technologies enable collaboration on a new scale. Their broad adoption will accelerate the need for analytics that automate the extraction of actionable insights from large volumes of user generated content (created both inside and outside the enterprise). To that end, social analytics appear to be approaching the phase of the hype cycle where early adopters investigate. Based on my discussions with executives, this is absolutely the case. An interesting note however is that Gartner sees mainstream adoption of social analytics happening in 2 to 5 years. I believe the business imperative to address both the risk and opportunity associated with user generated content could accelerate its movement on the curve. As is usually the case with these hype cycles, there is plenty here to debate, but great food for thought. This post seems to get a great deal of visitors. How do you advertise it? It gives a nice unique twist on things. I guess having something real or substantial to say is the most important factor.